The Twins made an unexpected addition to their burgeoning bullpen over the weekend, adding former Mets and Red Sox reliever Addison Reed on a two-year pact worth $16.75 million. The deal profiles well for the Twins on a number of fronts. At 29, Reed is at the younger end of a relief pitching market deep in high quality back end bullpen arms. Reed represents the first multi-year deal the Twins have ever signed with an outside reliever in free agency. In spite of this, the Twins locked Reed up on a short contract, at a price which they undoubtedly would have had to surpass had they signed him earlier in free agency. Reed joins a Twins bullpen shaping up to be vastly different, and potentially much improved over its 2017 iteration. In addition to returning standout Trevor Hildenberger, the Twins have added Fernando Rodney, presumably filling the vacant ninth inning role, and Zach Duke, returning from an injury-plagued 2017 season. In the former trio, the Twins seemed to have established a penchant for the traits they are pursuing in improving their bullpen; inducing ground balls and a lot of strikeouts, hardly a pioneering recipe for success. In Reed however, they have added a pitcher who generates more fly balls, so what about Reed has made him such a consistent a reliable late inning reliever? There’s no real intricacy in Reed’s pitch mix. He throws a four seem fastball around 66% of the time, a slider 33% of the time, and a changeup about as often as Byron Buxton gets caught stealing a base. Reed has excellent control, posting a walk rate of 1.51 BB/9 in 2016 and 1.78 BB/9 in 2017. Reed’s 2017 BB/9 was good for 11th among relievers who pitched at least 50 innings. This level of control was not always a staple of Reed’s pitching. In his first 3 seasons in MLB his BB/9 oscillated between 2.90 and 3.05. While this may seem like a trivial difference, this is a difference of around 10-11 walks over a 75 inning sample, a big deal when you’re constantly pitching in high leverage situations. So what is at the root of Reed’s improved control since the beginning of the 2016 season? In 2016, Reed produced a dramatic improvement in his overall numbers. In addition to refining his control, Reed stranded around 5% more baserunners, increased his K/9 from 8.2 to 10.55 and dropped his xFIP from 4.04 to 2.09. Reed has never had elite velocity. While some have commented on a dip in velocity throughout the past two seasons, his average four seam fastball velocity has remained fairly consistent, dropping from 93.66 mph in April of 2015 to 92.72 mph in October of 2017. So if Reed isn’t blowing hitters away, how did his K/9 improve and stick above 9.0 in his last two seasons? The number that jumps out in Reed’s improvement from 2015 to 2016 is his F-Strike% (percentage of the time Reed is throwing a first pitch strike). In 2015 Reed’s F-Strike% was around 56%. In 2016, it jumped to 70%. 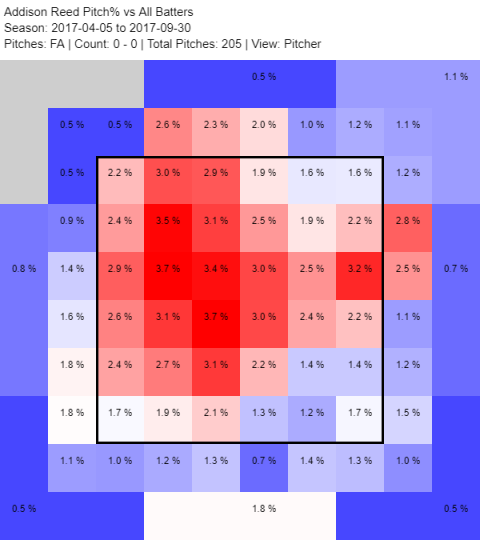 For the sake of comparison, old friend Pat Neshek had an F-Strike% of 71.1% in 2017 and had an incredible BB/9 of 0.87. This is a dramatic improvement from Reed which is even more impressive when visualized. Here’s a look at Reed’s heat map from 2015. 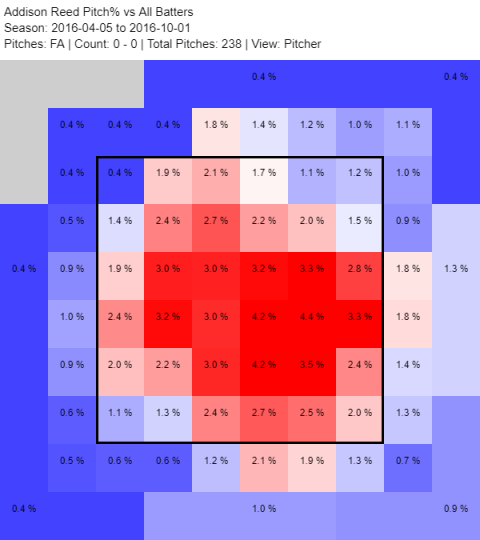 This charts the percentage a pitch falls within a sub-location of the strike zone. For all three of these searches I looked at heat maps representing the first pitch of a plate appearance, exclusively when Reed threw his four seem fastball. You’ll immediately notice a stark contrast between 2015 and 2016. 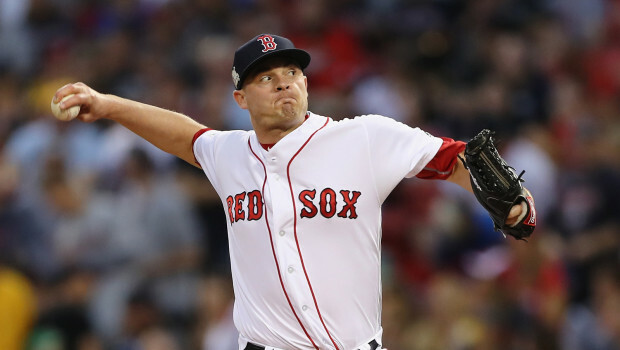 Reed improved in two notable areas, pounding the strike zone with a greater level of consistency, and using a greater portion of the strike zone when throwing first pitch strikes. We see a similar performance in 2017 (although not quite as impressive). 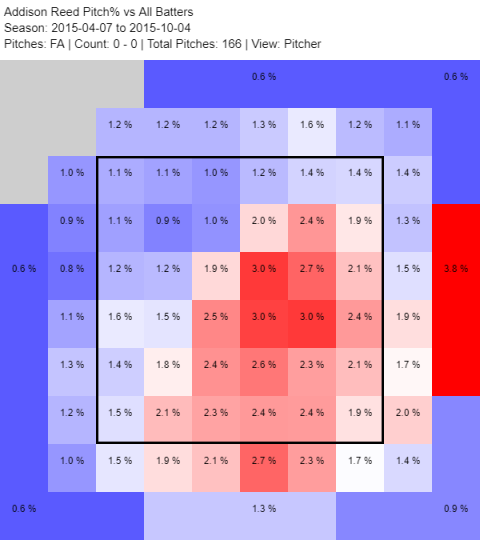 Interestingly, Reed’s obvious trend in locating his first pitch strikes higher in the zone in resulted in opposing batters OPS increasing from .587 in 2016, to .862 in 2017. So where does Reed fit in the back end of a Twins bullpen which has been dramatically upgraded from a year ago? Initially, there was contention that adding Reed might create a closer controversy in Minnesota. The Twins had recently added Fernando Rodney to the pen on a one year deal. It seems as if the Twins will stick with Rodney as their primary ninth inning option. Since taking on his role with the Twins, Paul Molitor has been criticized in his bullpen management for traditionalism, a tendency to use each of his relievers in a pre-determined role. Intractably funneling Rodney into save situations may allow Molitor the luxury of using both Reed and Trevor Hildenberger as more flexible relievers, whose appearances are dictated by the leverage of a given situation, rather than the inning they are pitching in. In addition to providing Molitor with another quality arm, Reed may provide the impetus for Molitor to get more creative in facilitating the evolution of the Twins bullpen, maximizing the potential of a vastly upgraded group. Kintzler did a a fantastic job the first chunk of the season and Belisle did a fantastic job the second half.If Rodney can come close to the combined performance of those two in late innings I would be thrilled but also a bit surprised.If there is an upgrade I consider it to be this move (Reed) along with the emergence of Hildenberger.Vastly upgraded remains to be seen. I thought the Twins did a great job of closing out winnable games last year while getting destroyed in games where the chances of winning were low anyway. I appreciate that we now have more depth and hope it translates to more wins. We exceeded the pythagorean win projection last year.I am just hoping the improved depth gets us the same wins without needing to beat it in 2018.